(1) George1 CAMPBELL was born in 1770 in Va., and before 1796 in Va., married (2) Elizabeth DOBKINS who was born in 1776 in Va.. George died after 1850 in Claiborne Co. Tenn. Elizabeth died after 1850 in Claiborne Co. Tenn.
(3) Barnette2 CAMPBELL, (George1 CAMPBELL) was born in 1797, and before 1820, married (11) Mary BROOKS, daughter of Gideon BROOKS, who was born about 1800. Barnette died after 1846. Mary died before 1840 in Claiborne Co. Tenn. He also married on Mar 26, 1840 in Claiborne Co. Tenn., (22) Jane KESTERSON who was born in 1810. I just re-visited Claiborne County again today and saw your message. I apologize for not getting those pictures I promised sent to you yet – but death of my mother -- well, any, I’m back now. I will get you the photos that I promised I especially like the one that notes on the back “making sorghum in Tennessee ”. I believe most of the photos I have were taken in the early 1900’s by Lottie Campbell Neill, a daughter of Arthur L. and Sarah E. Klinginsmith Campbell. I also have a few that were taken by my husband, Charles’, parents in the late 50’s or early 60’s when they took Charles to Tennessee to visit the relatives and the old home place. Dear Mr. Payne: I’ve enjoyed reading your Claiborne County pages and the e-mail you posted from the gentlemen from North Carolina inquiring about the location of the Campbell cemetery. I’ve only recently (become interested in family history/genealogy, and am a rank novice, though I am more of a novice at e-mail. However I may have some information of interest to George Campbell family researchers. My husband is Charles E. Campbell, who is the son of James Arthur Campbell, who is the son of Ralph L. Campbell (1881 – 1919), who is the son of Arthur L. Campbell (b: 19 Dec. 1842, d: 03 July, 1904) who is the son of Barnett Campbell and Jane Kesterson. My father-in-law was researching his family history in the early 1960’s. We have several letters from cousins and other family members in Tennessee and elsewhere dated in the early 1960’s. One of the letters is from his cousin, Nancy Smith, of New Tazewell, Tennessee, her 3 page typewritten letter follows. I was so glad to hear from you and to get the information that you sent. I may never get my information together enough to publish, but I would like to share some of the information that I have with you. Please forgive my typing mistakes, I am use to the electric typewriter at the office an my portable is hard to use now. *Barnett (Barney) born about 1797 married Mary Brooks and Jane (Jenny) Kesterson. *Note: Both of these are early grandparents of mine. 4. N. G. (Nute) b – Dec. 29, 1845, d-June 23, 1911. He married Lucy Williams b – Feb. 18, 1862 – d. Jan 23, 1943. ( Lucy Williams was a granddaughter of John Campbell and a sister to my grandmother) They had one daughter, Mollie, born Nov. 7, 1879, died Oct. 2, 1899, unmarried. Esther Jane Campbell b married Andrew Johnson DeBusk (my father) and they had nine children. Robert Campbell born in County Down Ireland about 1718 and landed in Philadelphia at the age of 7 years He went to Prince Edward County in Virginia, afterwards. In 1776 he moved with his sons to Carter Valley, North Carolina (This is now Tenn.) In 1738 or 40, was married to Leticia Crocket, who died in Prince Edward Co., Va. He was a farmer. He died Dec. 24, 1810 and was buried in Carter Valley near his home. He was the father of ten children: Alexander, James, Elizabeth, Catherine, Anna, Jane, these were by his wife Leticia Crocket. (I have no definite proof, but I think James listed above was the father of our George). Robert married Jane Allison who died in 1820 and they had: Robert, Jr., Joseph, Leticia and Andrew. Jane Allison was born in Rockbridge Co., Va.
Robert Jr. was born in Rockbridge Co. Va. Jan 3, 1761. He was married in Va. In 1785. By this time you should be so mixed up from all the names I have given you that you will have to write me another letter. I wish you and your family could be here with us on August 26, when we will celebrate my grandmother’s 96th birthday. That is the Sunday that comes closest to the 29th, her real birthday. She is quite a woman for her age, she still get around and takes care of the chickens, is the first person up in the morning and starts breakfast. She is almost blind, but her mind is still alert, and her hearing is good for the years she has lived. God has in deed been good to us. She and Uncle Will took the four of us when Mother died, and she is the only Mother I have ever known. I don’t have a scanner (trust me if I did, I wouldn’t have re-typed her letter), but I may be able to get one of my daughters to do it for me. 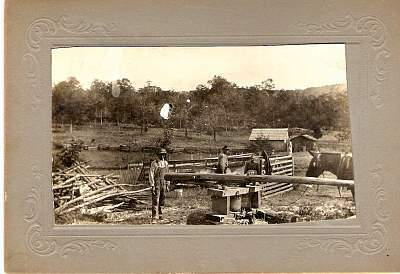 I have some old photographs of Claiborne County, of the Campbell homestead in Lincoln County, Oklahoma. There’s a letter postmarked Sept, 14 1964 from an A. L. Campbell, Tazewell, Tenn, wherein he writes about the changes since 1916. Though I am not certain, I believe it is from Arthur L. Campbell, son of Alexander Campbell. (4) Dorcus2 CAMPBELL, (George1 CAMPBELL) was born about 1799, and married (27) John WHITEAKER who was born in 1795. Many believe that John Whitaker was the son of a Giles WHITAKER and Mary Ann (Molly) RICE and a brother of Rev. Rice Whitaker. She also married (41) James JONES. No children of this marriage in these records. (5) Peggy2 CAMPBELL, (George1 CAMPBELL) was born about 1801, and married (42) Preston BROOKS who was born about 1800. Preston BROOKS was the son of Armistead BROOKS and Nancy Ann HARRISON. (6) Jenny2 CAMPBELL, (George1 CAMPBELL) was born about 1802, and married (44) Henry SMITH. (7) James2 CAMPBELL, (George1 CAMPBELL) was born Jan 16, 1808 in Claiborne Co. Tenn., and about 1825 in Tennessee, married (45) Martha NEVILS who was born Aug 28, 1809 in Va.. Martha was the daughter of James NEVILS and Nancy BROOKS, brother to George Washington NEVILS. James died on Feb 12, 1848 in Claiborne Co. Tenn. Martha died on Jan 16, 1897. (8) Charles2 CAMPBELL, (George1 CAMPBELL) was born Oct 25, 1805, and married (54) Dorcas JONES who was born in 1812. Charles died in 1891. (9) John2 CAMPBELL, (George1 CAMPBELL) was born in 1810 in Tn., and about 1830 in Tn., married (72) Sarah WILLIS who was born in 1810 in Va..
(10) Elizabeth2 CAMPBELL, (George1 CAMPBELL) married (80) Anderson SMITH. (12) George3 CAMPBELL, (Barnette2 CAMPBELL, George1) was born in 1817 in Claiborne Co. Tn, and on Feb 10, 1842 in Claiborne Co. Tenn., married (81) Nancy EASTRIDGE who was born in 1827 in Tennessee. George died before 1870 in Claiborne Co., Tn. (13) Benjamin3 CAMPBELL, (Barnette2 CAMPBELL, George1) was born in 1820 in Va., and on Sep 29, 1842 in Claiborne Co. Tenn., married (91) Eliza EASTRIDGE who was born in 1827 in KY.. Benjamin died in 1882. Eliza died about 1864 in Claiborne Co. Tenn. He also married on Nov 20, 1866 in Claiborne Co. Tenn., (100) Elizabeth J. LANHAM who was born about 1820. (14) Louisa3 CAMPBELL, (Barnette2 CAMPBELL, George1) was born about 1823 in Claiborne Co. Tenn., and on Feb 20, 1840 in Claiborne Co. Tenn., married (101) James R. JENNINGS who was born in 1816 in Tn..
Sarah JENNINGS b. 1843 in Claiborn Co, TN migrated to Denton Co, TX by the 1880 census and was living in the household of Seroi HURST who had also lived in Claiborn Co. Does anyone know if there is a family connection? I have been unable to determine the husband of Sarah who is probably the daughter of James R. Jennings and Louisa CAMPBELL. (15) Eldridge3 CAMPBELL, (Barnette2 CAMPBELL, George1) was born about 1824 in Claiborne Co. Tenn., and on Jun 24, 1845 in Claiborne Co. Tenn., married (112) Emeline HAZELWOOD who was born in 1829 in Tennessee. Eldridge died after 1880. Emeline died after 1880. (16) Andrew3 CAMPBELL, (Barnette2 CAMPBELL, George1) was born in 1826 in Claiborne Co. Tenn., and on Nov 2, 1844 in Claiborne Co. Tenn., married (125) Louisa CAMPBELL who was born in 1830 in Tennessee. (17) Mary3 CAMPBELL, (Barnette2 CAMPBELL, George1) was born in 1828. Married James D. Walker. Transfer of deed shows that Jaems purchased the land his father (Samuel) owned upon his death. The land was purchased from James’ brothers. His brother john lived with james and Mary Ann at the time of the 1850 census. From page 189 of “Old Time Tazewell”, the name of Mary Ann and james D. Walker’s son was Ewell not Ewing as previously reported from the census. It is reported that he died in 1893 from an accidental cutting of his finger on a can of fruit. He got blood poisoning and died a few days thereafter. He was brought home from Middlesboro and buried in their family burying ground. (18) John3 CAMPBELL, (Barnette2 CAMPBELL, George1) was born in 1829 in Va., and on May 16, 1850 in Claiborne Co. Tenn., married (129) Mary Ann CHADWELL who was born in 1830 in Tn.. John died after 1900 in Claiborne Co. Tenn. Mary Ann died in Tn..
(19) Emily3 CAMPBELL, (Barnette2 CAMPBELL, George1) was born in 1831 in Claiborne Co. Tenn., and on Jul 5, 1848 in Claiborne Co. Tenn., married (137) Levi BROOKS who was born in 1804 in Tennessee. (21) Lucretia “Lucy” Lucinda Campbell Birth: 23 May 1831, Virginia Death: 3 Jul 1904 (Barnette2 CAMPBELL, George1). cousin to a james and Isaac Walker. Therefore, John W. Walker is also a cousin to these two brothers. that she wasn’t born in Tennessee. On a visit to the Cox Cemetery in October 1995, John and Lucy have a new head stone that wasn’t there in 1992. John Wesley Walker is the correct middle name as recorded on deeds. (23) Charles3 CAMPBELL, (Barnette2 CAMPBELL, George1) was born in 1841. (24) Arthur L.3 CAMPBELL, (Barnette2 CAMPBELL, George1) was born in 1842. He married Sarah Ellen Clingsmith. The Arthur L. Campbell family has some family pictures sent by Clella Campbell clellacampbell@yahoo.com. Click on the picture above for more. (25) David H.3 CAMPBELL, (Barnette2 CAMPBELL, George1) was born in 1844. (26) Newton J.3 CAMPBELL, (Barnette2 CAMPBELL, George1) was born in 1846. (28) Mary3 WHITEAKER, (Dorcus2 CAMPBELL, George1) was born in 1819, and married (159) ??? SAWTELLE. ??? was married to Mary WHITEAKER. She also married (160) J.B. MUNCY. (29) James Madison3 WHITEAKER, (Dorcus2 CAMPBELL, George1) was born in 1820, and married (161) Mary HOWELL who was born in 1825. (30) Elizabeth3 WHITEAKER, (Dorcus2 CAMPBELL, George1) was born about 1822, and married (174) George HEPNER. (31) George Smith3 WHITEAKER, (Dorcus2 CAMPBELL, George1) was born in 1826, and married (175) Nancy Elinor GILLHAM who was born in 1828. (32) Pryor Lee3 WHITEAKER, (Dorcus2 CAMPBELL, George1) was born in 1829, and married (183) Emily J. TAYLOR who was born in 1834. (33) Rhoda3 WHITEAKER, (Dorcus2 CAMPBELL, George1) was born in 1831, and married (193) Lindsey Green PITTMAN who was born in 1818. (34) Francis Jane3 WHITEAKER, (Dorcus2 CAMPBELL, George1) was born in 1833, and married (199) Jonathan M. BERRY who was born in 1811. (35) John C3 WHITEAKER, (Dorcus2 CAMPBELL, George1) was born in 1835, and married (203) Mary J. ??? who was born in 1840. (36) ISABELA3 WHITEAKER, (Dorcus2 CAMPBELL, George1) was born in 1836, and married (206) John DOUGLAS who was born in 1832. She also married (210) John ALLEN. She also married (212) James GRUBB. (37) Mary3 WHITEAKER, (Dorcus2 CAMPBELL, George1) was born in 1836, and married (159) ??? SAWTELLE. ??? was married to Mary WHITEAKER. (38) Virginia3 WHITEAKER, (Dorcus2 CAMPBELL, George1) was born in 1838. (39) Joseph3 WHITEAKER, (Dorcus2 CAMPBELL, George1) was born in 1839. (40) Eldridge3 WHITEAKER, (Dorcus2 CAMPBELL, George1) was born in 1845. (43) Preston3 BROOKS, Jr., (Peggy2 CAMPBELL, George1) was born in 1826 in Claiborne Co. Tenn., Claiborne Co., Tn, and married (46) Lucy Ann CAMPBELL, daughter of James CAMPBELL and Martha NEVILS, who was born in 1829 in Claiborne Co. Tenn.
(46) Lucy Ann3 CAMPBELL, (James2 CAMPBELL, George1) was born in 1829 in Claiborne Co. Tenn., and married (43) Preston BROOKS, Jr., son of Preston BROOKS and Peggy CAMPBELL, who was born in 1826 in Claiborne Co. Tenn., Claiborne Co., Tn. (47) Armstrong3 CAMPBELL, (James2 CAMPBELL, George1) was born in 1832. (48) Adeline3 CAMPBELL, (James2 CAMPBELL, George1) was born in 1833, and married (215) Benjamin CLOUD who was born in 1826 in Tennessee. (49) Mary3 CAMPBELL, (James2 CAMPBELL, George1) was born in 1837, and married (216) Samuel CHADWELL who was born in 1826. (50) Elizabeth3 CAMPBELL, (James2 CAMPBELL, George1) was born in 1839. (51) Sarah3 CAMPBELL, (James2 CAMPBELL, George1) was born in 1841, and about 1864, married (224) John H. BROOKS who was born in 1824. She also married (234) Enoch CARMACK who was born in 1836. (52) James3 CAMPBELL, (James2 CAMPBELL, George1) was born in 1844. (53) George3 CAMPBELL, (James2 CAMPBELL, George1) was born in 1846. (55) Elizabeth3 CAMPBELL, (Charles2 CAMPBELL, George1) was born in 1828, and married (237) Andy CAMPBELL who was born before 1828. (56) Mason3 CAMPBELL, (Charles2 CAMPBELL, George1) was born in 1829. (57) Eliza3 CAMPBELL, (Charles2 CAMPBELL, George1) was born in 1834, and married (238) Andrew CAMPBELL who was born before 1835. (58) Emily A.3 CAMPBELL, (Charles2 CAMPBELL, George1) was born in 1835 in Claiborne Co. Tenn., and on Aug 11, 1850 in Claiborne Co. Tenn., married (239) Edward BRAY who was born in 1824 in Tn..
(59) Margaret3 CAMPBELL, (Charles2 CAMPBELL, George1) was born in 1837, and on Feb 18, 1853 in Claiborne Co. Tn, married (240) Thomas CAMPBELL. (60) Alexander3 CAMPBELL, (Charles2 CAMPBELL, George1) was born in 1839 in Claiborne Co., Tn, and married (219) Margaret Elizabeth CHADWELL, daughter of Samuel CHADWELL and Mary CAMPBELL, who was born in 1859. Alexander died on Mar 27, 1911 in Mansfield, Wright Co., MO and was buried in Schoolyard. Margaret Elizabeth died in 1950. (73) William P.3 CAMPBELL, (John2 CAMPBELL, George1) was born about 1832 in Claiborne Co. Tn, and on Jan 6, 1856 in Claiborne Co. Tn, married (255) Elizabeth MASSENGALE who was born about 1836 in Claiborne Co. Tn. (74) Nervesta3 CAMPBELL, (John2 CAMPBELL, George1) was born in 1835. (75) George F.3 CAMPBELL, (John2 CAMPBELL, George1) was born in 1837. (76) Marian3 CAMPBELL, (John2 CAMPBELL, George1) was born in 1839. (77) James P.3 CAMPBELL, (John2 CAMPBELL, George1) was born in 1842 in Claiborne Co. Tn, and married (261) Nancy Evaline ESTEP, daughter of William ESTEP and Elizabeth EASTRIDGE, who was born in 1849 in Claiborne Co. Tn. James P. died in Oklahoma. Nancy Evaline died in Oklahoma. (78) Joel3 CAMPBELL, (John2 CAMPBELL, George1) was born in 1845. (79) Benjamin3 CAMPBELL, (John2 CAMPBELL, George1) was born in 1847, and married (262) Phoebe BARTLETT, daughter of John BARTLETT and Nancy MASON, who was born in 1836. (82) Lucy Jane4 CAMPBELL, (George3 CAMPBELL, Barnette2, George1) was born about 1840 in Claiborne Co., Tn, and on Nov 8, 1859 in Claiborne Co. Tenn., married (263) Abraham LEWIS, son of William LEWIS and Sarah Sally BOYERS, who was born Dec 14, 1837 in Bear Creek, Claiborne Co., Tn. Lucy Jane died in 1920. Abraham died after 1880. (83) Robert4 CAMPBELL, (George3 CAMPBELL, Barnette2, George1) was born in 1845, and married (270) Sallie R. THOMAS. (84) Louiza Eliza4 CAMPBELL, (George3 CAMPBELL, Barnette2, George1) was born in 1847. (85) James C.4 CAMPBELL, (George3 CAMPBELL, Barnette2, George1) was born in 1849 in Lone Mountain, Claiborne Co., Tn, and married spouse unknown. (98) Marcillus4 CAMPBELL, (Benjamin3 CAMPBELL, Barnette2, George1) was born in 1863, and married (273) Lilly HALL. (99) Henley4 CAMPBELL, (Benjamin3 CAMPBELL, Barnette2, George1) was born in 1864. (102) Mary J.4 JENNINGS, (Louisa3 CAMPBELL, Barnette2, George1) was born in 1841. (103) Sarah E.4 JENNINGS, (Louisa3 CAMPBELL, Barnette2, George1) was born in 1843, and married spouse unknown. Sarah JENNINGS who was b. in 1843 in Claiborne Co, TN was probably the daughter of James R. Jennings and Louisa CAMPBELL. In 1880, she had moved to Denton Co, TX where she is listed in the household of Seroi HURST also originally of Claiborne Co. Does anyone know if there is a family connection between Sarah and Seroi? I have been unable to determine the husband of Sarah and any assistance would be appreciated. (113) Elizabeth4 CAMPBELL, (Eldridge3 CAMPBELL, Barnette2, George1) was born in 1847 in Claiborne Co. Tenn., and in 1877 in Claiborne Co. Tenn., married (279) George W. LIFORD who was born in 1828. (114) Peter4 CAMPBELL, (Eldridge3 CAMPBELL, Barnette2, George1) was born in 1848 in Claiborne Co. Tenn., and married (280) Lettice GIBSON who was born in 1845. (115) Barnette4 CAMPBELL, (Eldridge3 CAMPBELL, Barnette2, George1) was born in 1850, and married (281) Annie Martha GIBSON who was born in 1853. Barnette died after 1938. Annie Martha died after 1920. (116) Benjamin Franklin4 CAMPBELL, (Eldridge3 CAMPBELL, Barnette2, George1) was born in 1853, and married (282) Susan Mary TUGGLE who was born in 1860. Benjamin Franklin died in 1936. Susan Mary died in 1940. (117) Clinton4 CAMPBELL, (Eldridge3 CAMPBELL, Barnette2, George1) was born in 1855, and married (283) Martha E. ENSOR who was born in 1861. Clinton died in 1938. Martha E. died about 1925. (118) Nelson4 CAMPBELL, (Eldridge3 CAMPBELL, Barnette2, George1) was born in 1857 in Claiborne Co. Tenn., and on Mar 15, 1883 in Claiborne Co. Tenn., married (284) Martha J. LEWIS who was born in 1865. Nelson died in 1919. Martha J. died in 1921. (119) Eliza4 CAMPBELL, (Eldridge3 CAMPBELL, Barnette2, George1) was born in 1861. Eliza died before 1938. (120) Chadwell4 CAMPBELL, (Eldridge3 CAMPBELL, Barnette2, George1) was born in 1864, and married (285) Cora B. ENSOR. Chadwell died in 1910. (121) Salinda4 CAMPBELL, (Eldridge3 CAMPBELL, Barnette2, George1) was born in 1866, and married (286) Beauregard BRAY. Salinda died after 1938. She also married (287) Millard F. WELCH. (122) Robert4 CAMPBELL, (Eldridge3 CAMPBELL, Barnette2, George1) was born in 1868, and married (288) Phoebe Elizabeth LEWIS. Robert died in 1948. (123) John Dock4 CAMPBELL, (Eldridge3 CAMPBELL, Barnette2, George1) was born in 1871, and married (289) Nellie LANAHAM who was born in 1880. John Dock died in 1936. Nellie died in 1962. (130) Sterling4 CAMPBELL, (John3 CAMPBELL, Barnette2, George1) was born in 1851 in Claiborne Co. Tenn., and on Oct 27, 1869 in Claiborne Co. Tenn., married (290) Barbary YEARY who was born in 1846 in Lee Co. Va..
(131) Toliver Dotson4 CAMPBELL, (John3 CAMPBELL, Barnette2, George1) was born in 1854 in Lee Co. Va., and on Nov 8, 1872 in Claiborne Co. Tenn., married (296) Eliza Adaline BROWN, daughter of John BROWN and Sarah BROWN, who was born in 1854 in Lee Co. Va.. Toliver Dotson died after 1900. Eliza Adaline died after 1910. (132) Louisa4 CAMPBELL, (John3 CAMPBELL, Barnette2, George1) was born in 1856. (133) Elbert4 CAMPBELL, (John3 CAMPBELL, Barnette2, George1) was born in 1858 in Tn., and on Mar 21, 1880 in Claiborne Co. Tenn., married (303) Catherine BROWN who was born in 1852 in Tn..
(134) Lucy A.4 CAMPBELL, (John3 CAMPBELL, Barnette2, George1) was born in 1859. (135) Thomas4 CAMPBELL, (John3 CAMPBELL, Barnette2, George1) was born in 1863. (136) Manda4 CAMPBELL, (John3 CAMPBELL, Barnette2, George1) was born in 1865 in Claiborne Co. Tenn., and on Aug 22, 1889 in Claiborne Co. Tenn., married (304) John LOOP who was born in 1845 in Va.. Manda died before 1892 in Claiborne Co. Tenn.
(163) George Smith4 WHITEAKER, (James3, Dorcus2 CAMPBELL, George1) was born in 1847, and married (305) Susan M. ???. (177) John Newton4 WHITEAKER, (George3, Dorcus2 CAMPBELL, George1) was born in 1855, and married (306) Mary Louella LUNBECK who was born in 1864. (214) Ira Armstrong4 BROOKS, (Preston3 BROOKS, Peggy2 CAMPBELL, George1) was born Oct 13, 1861, and married (311) Eliza WILSON who was born Apr 8, 1867. (213) George Washington4 BROOKS, (Lucy3 CAMPBELL, James2, George1) was born Mar 25, 1855 in Claiborne Co., Tn. (214) Ira Armstrong4 BROOKS, (Lucy3 CAMPBELL, James2, George1) was born Oct 13, 1861, and married (311) Eliza WILSON who was born Apr 8, 1867. (217) John B.4 CHADWELL, (Mary3 CAMPBELL, James2, George1) was born in 1855. (218) Golvin4 CHADWELL, (Mary3 CAMPBELL, James2, George1) was born in 1857. (219) Margaret Elizabeth4 CHADWELL, (Mary3 CAMPBELL, James2, George1) was born in 1859, and married (60) Alexander CAMPBELL, son of Charles CAMPBELL and Dorcas JONES, who was born in 1839 in Claiborne Co., Tn. Margaret Elizabeth died in 1950. Alexander died on Mar 27, 1911 in Mansfield, Wright Co., MO and was buried in Schoolyard. (227) William Floyd4 BROOKS, (Sarah3 CAMPBELL, James2, George1) was born in 1869, and married (313) Cornelia NEVILS who was born in 1872. (228) Armintie4 BROOKS, (Sarah3 CAMPBELL, James2, George1) was born in Apr 1871 in Claiborne Co. Tenn., and on Dec 3, 1887 in Claiborne Co. Tenn., married (324) John TOWNSLEY who was born in May 1869. (241) Dick4 CAMPBELL, (Margaret3 CAMPBELL, Charles2, George1) married (329) Alice ???. (242) Angeliine4 CAMPBELL, (Margaret3 CAMPBELL, Charles2, George1) married (330) ??? SCOTT. (243) Emma4 CAMPBELL, (Margaret3 CAMPBELL, Charles2, George1) married (331) John SULLIVAN. (244) Mary4 CAMPBELL, (Margaret3 CAMPBELL, Charles2, George1) married (332) Charlie SULLIVAN. (245) Ollie4 CAMPBELL, (Margaret3 CAMPBELL, Charles2, George1) married (333) John ELSESSER. (246) Mary4 CAMPBELL, (Alexander3 CAMPBELL, Charles2, George1) was born in 1880, and married (334) Frank BARMETTLAR. (247) Docia4 CAMPBELL, (Alexander3 CAMPBELL, Charles2, George1) was born in 1882, and married (335) Phillip Henry BENJAMIN. She also married (336) John Firlding C. SHAW who was born in 1868. (248) Charlie4 CAMPBELL, (Alexander3 CAMPBELL, Charles2, George1) was born in 1884. (249) Ollie Elizabeth4 CAMPBELL, (Alexander3 CAMPBELL, Charles2, George1) was born in 1886, and married (342) Creed QUILLEN. (250) James Samuel4 CAMPBELL, (Alexander3 CAMPBELL, Charles2, George1) was born in 1889, and married (343) Daisy LIVESAY. (251) Virgie OTHA4 CAMPBELL, (Alexander3 CAMPBELL, Charles2, George1) was born in 1892, and married (344) Foster Cenkie NEWTON. (252) Navada May4 CAMPBELL, (Alexander3 CAMPBELL, Charles2, George1) was born in 1895, and married (345) William Beaden DAVIS. (253) Levy Alexander4 CAMPBELL, (Alexander3 CAMPBELL, Charles2, George1) was born in 1898. (254) Roxie Faye4 CAMPBELL, (Alexander3 CAMPBELL, Charles2, George1) was born in 1901. (256) Eliza Jane4 CAMPBELL, (William3 CAMPBELL, John2, George1) was born in 1856 in Tennessee, and on Apr 21, 1872 in Claiborne Co. Tenn., married (346) Moses BROWN, son of John BROWN and Sarah BROWN, who was born in 1851 in Lee Co. Virgina. Moses died in Tn..
(268) Milton5 LEWIS, (Lucy4 CAMPBELL, George3, Barnette2, George1) was born Feb 8, 1876 in Claiborne Co., Tn, and married (355) Clara M. FARMER, daughter of Billy FARMER and Manerva REDMON, who was born Jun 29, 1883 in Claiborne Co., Tn. Milton died on Apr 6, 1951 in Claiborne Co., Tn and was buried in Campbell Cem. Clara M. died on Apr 6, 1967 in Claiborne Co., Tn and was buried in Campbell Cem. (269) Daniel R.5 LEWIS, (Lucy4 CAMPBELL, George3, Barnette2, George1) was born in 1878. (271) Maggie5 CAMPBELL, (James4 CAMPBELL, George3, Barnette2, George1) was born about 1868 in Claiborne Co., Tn, and married (366) Jefferson HODGE, son of William B. Hodges and Lucy Ann SHUMATENN., who was born about 1858 in Claiborne Co., Tn. (297) Sarah Clementine5 CAMPBELL, (Oliver4 CAMPBELL, John3, Barnette2, George1) was born in 1873 in Lee Co. Virgina, and in 1898 in Claiborne Co. Tenn., married (367) Nathan A. PACE who was born in May 1873 in Claiborne Co. Tn. (298) Rebecca A.5 CAMPBELL, (Oliver4 CAMPBELL, John3, Barnette2, George1) was born in 1874 in Lee Co. Virgina. Rebecca A. died before 1900. (299) ARLENE5 CAMPBELL, (Oliver4 CAMPBELL, John3, Barnette2, George1) was born Oct 12, 1882 in Claiborne Co. Tn, and on Oct 3, 1908 in Bell County Kent, married (368) William H. GIBSON who was born May 4, 1882 in Bell County Kent. ARLENE died on Nov 14, 1959 in Bell County Kent. William H. died on Oct 3, 1963 in Bell County Kent. (300) Tillman5 CAMPBELL, (Oliver4 CAMPBELL, John3, Barnette2, George1) was born Jun 2, 1885 in Claiborne Co. Tenn., and about 1910 in Claiborne Co. Tenn., married (314) Mossie BROOKS, daughter of William Floyd BROOKS and Cornelia NEVILS, who was born in 1889 in Claiborne Co. Tenn. Tillman died on Jan 16, 1940 in Claiborne Co. Tenn. Mossie died in Claiborne Co. Tenn.
(301) MILBURN5 CAMPBELL, (Oliver4 CAMPBELL, John3, Barnette2, George1) was born in Oct 1888 in Claiborne Co. Tn. (302) Pearl5 CAMPBELL, (Oliver4 CAMPBELL, John3, Barnette2, George1) was born in Mar 1892, and married (369) ? HILL. (307) Frank Norris5 WHITEAKER, (John4, George3, Dorcus2 CAMPBELL, George1) was born in 1885, and married (370) Amey NORTHEY who was born in 1885. (312) Cillus GILMORE5 BROOKS, (Ira4 BROOKS, Preston3, Peggy2 CAMPBELL, George1) was born Mar 23, 1892 in Va., and married (371) Mary Hannah GOLDEN who was born May 22, 1894. (312) Cillus GILMORE5 BROOKS, (Ira4 BROOKS, Lucy3 CAMPBELL, James2, George1) was born Mar 23, 1892 in Va., and married (371) Mary Hannah GOLDEN who was born May 22, 1894. (246) Mary5 CAMPBELL, (Margaret4 CHADWELL, Mary3 CAMPBELL, James2, George1) was born in 1880, and married (334) Frank BARMETTLAR. (247) Docia5 CAMPBELL, (Margaret4 CHADWELL, Mary3 CAMPBELL, James2, George1) was born in 1882, and married (335) Phillip Henry BENJAMIN. (248) Charlie5 CAMPBELL, (Margaret4 CHADWELL, Mary3 CAMPBELL, James2, George1) was born in 1884. (249) Ollie Elizabeth5 CAMPBELL, (Margaret4 CHADWELL, Mary3 CAMPBELL, James2, George1) was born in 1886, and married (342) Creed QUILLEN. (250) James Samuel5 CAMPBELL, (Margaret4 CHADWELL, Mary3 CAMPBELL, James2, George1) was born in 1889, and married (343) Daisy LIVESAY. (251) Virgie OTHA5 CAMPBELL, (Margaret4 CHADWELL, Mary3 CAMPBELL, James2, George1) was born in 1892, and married (344) Foster Cenkie NEWTON. (252) Navada May5 CAMPBELL, (Margaret4 CHADWELL, Mary3 CAMPBELL, James2, George1) was born in 1895, and married (345) William Beaden DAVIS. (253) Levy Alexander5 CAMPBELL, (Margaret4 CHADWELL, Mary3 CAMPBELL, James2, George1) was born in 1898. (254) Roxie Faye5 CAMPBELL, (Margaret4 CHADWELL, Mary3 CAMPBELL, James2, George1) was born in 1901. (314) Mossie5 BROOKS, (William4 BROOKS, Sarah3 CAMPBELL, James2, George1) was born in 1889 in Claiborne Co. Tenn., and about 1910 in Claiborne Co. Tenn., married (300) Tillman CAMPBELL, son of Oliver Dotson CAMPBELL and Eliza Adaline BROWN, who was born Jun 2, 1885 in Claiborne Co. Tenn. Mossie died in Claiborne Co. Tenn. Tillman died on Jan 16, 1940 in Claiborne Co. Tenn.
(349) John E.5 BROWN, (Eliza4 CAMPBELL, William3, John2, George1) was born in 1879. (350) Millard5 BROWN, (Eliza4 CAMPBELL, William3, John2, George1) was born Jun 6, 1880 in Claiborne Co. Tn, and on Jun 8, 1904 in Campbell Co. Tn., married (372) Rachael LONGWORTH who was born about 1887 in Tn.. Millard died on Dec 22, 1968 in Claiborne Co. Tn. (356) Robert Paul6 LEWIS, (Milton5 LEWIS, Lucy4 CAMPBELL, George3, Barnette2, George1) was born about 1912 in Claiborne Co., Tn, and on Apr 23, 1936, married (373) Edna Mae RITCHIE, daughter of Archibald Bodes RITCHIE and Debrah Louise GRABEEL, who was born Mar 24, 1911 in Tazewell TN, Tn. (357) Nannie Maude6 LEWIS, (Milton5 LEWIS, Lucy4 CAMPBELL, George3, Barnette2, George1) was born about 1914 in Claiborne Co., Tn. (358) Ethel6 LEWIS, (Milton5 LEWIS, Lucy4 CAMPBELL, George3, Barnette2, George1) was born about 1915 in Claiborne Co., Tn, and married (376) Robert WILEY who was born about 1912. (359) Martha6 LEWIS, (Milton5 LEWIS, Lucy4 CAMPBELL, George3, Barnette2, George1) was born about 1918 in Claiborne Co., Tn, and married (377) Ed STANIFER who was born about 1915 in Claiborne Co., Tn. (360) Beulah6 LEWIS, (Milton5 LEWIS, Lucy4 CAMPBELL, George3, Barnette2, George1) was born about 1920 in Claiborne Co., Tn, and married (378) Oscar LOY who was born about 1920. (361) Margaret6 LEWIS, (Milton5 LEWIS, Lucy4 CAMPBELL, George3, Barnette2, George1) was born about 1925 in Claiborne Co., Tn, and married (379) Neil WALKER who was born about 1915 in Claiborne Co., Tn. (362) Georgia6 LEWIS, (Milton5 LEWIS, Lucy4 CAMPBELL, George3, Barnette2, George1) was born about 1928 in Claiborne Co., Tn, and married (380) George POPE who was born about 1920 in Claiborne Co., Tn. (363) Archie6 LEWIS, (Milton5 LEWIS, Lucy4 CAMPBELL, George3, Barnette2, George1) was born about 1929 in Claiborne Co., Tn, and married (381) Elsie LOCKHART who was born about 1925 in Claiborne Co., Tn. (364) Patrick6 LEWIS, (Milton5 LEWIS, Lucy4 CAMPBELL, George3, Barnette2, George1) was born about 1930 in Claiborne Co., Tn, and married (382) Mary Beth MCCOULLOUGH, daughter of William MCCULLOUGH and Louiza Elizabeth HURST, who was born about 1930 in Claiborne Co., Tn. (374) Arch Richie7 LEWIS, Dr., (Robert6 LEWIS, Milton5, Lucy4 CAMPBELL, George3, Barnette2, George1) was born Jan 31, 1940, and married (383) Patricia Lynn BERRIER who was born Mar 24, 1945. (375) Robert Paul Lewis7 JR., (Robert6 LEWIS, Milton5, Lucy4 CAMPBELL, George3, Barnette2, George1) was born Aug 6, 1943, and married (387) LYNDA HARTSON who was born Sep 21, 1943. © Copywrite 2002-2003 Webworks, Inc.